FILE - Secretary of State Mike Pompeo, speaks at the close of a three-day conference on religious freedom at the State Department in Washington, July 26, 2018. U.S. Secretary of State Mike Pompeo has no intention of meeting his Iranian counterpart at an international gathering this weekend in Singapore, even as President Donald Trump says he is willing to talk with Tehran about its nuclear weapons development program. The top U.S. diplomat and Iranian foreign minister Mohammad Javad Zarif are both attending Saturday's meeting of the 10-nation Association of Southeast Asian Nations. But a senior U.S. State Department official said Tuesday there are no plans for the two officials to meet. FILE - Iranian Foreign Minister Javad Zarif speaks with the media after a meeting with European Union foreign policy chief Federica Mogherini at the Europa building in Brussels, May 15, 2018. The official said that North Korea will also be represented at the Singapore meeting, and while chance encounters for Pompeo are possible, no bilateral meetings have been scheduled. 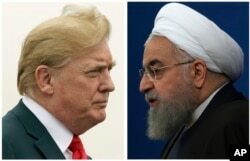 Trump, who pulled the U.S. out of the 2015 international agreement to restrain Iran's nuclear weapons development in exchange for relief from economic sanctions against Tehran, said Monday he would be willing to meet with Iranian President Hassan Rouhani. "I believe in meeting," Trump said at a White House news conference. "Speaking to other people, especially when you're talking about potentials of war and death and famine and lots of other things, you meet. There's nothing wrong in meeting." Trump noted his recent one-on-one discussions with North Korean leader Kim Jong Un and Russian President Vladimir Putin as examples of his direct diplomacy with leaders deemed hostile to U.S. interests. "So, I would certainly meet with Iran if they wanted to meet. I don't know that they're ready yet. They're having a hard time right now," Trump added. "I'm ready to meet anytime they want to." Asked if he had any preconditions for such a meeting, Trump replied: "No preconditions. If they want to meet, I'll meet." Later, in an interview with the cable television network CNBC, Pompeo said Trump is prepared to sit down with the Iranians if they "make fundamental changes in how they treat their own people, reduce their malign behavior," and agree it is worthwhile to put in place a nuclear agreement "that actually prevents proliferation." 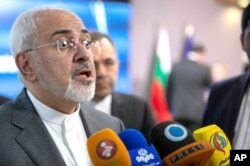 Iran responded by saying the path to direct discussions with Washington would have to include the United States returning to the Joint Comprehensive Plan of Action (JCPOA), as the nuclear deal between Iran and China, France, Russia, Britain, Germany, the U.S. and the European Union was formally called. "Respecting the Iranian nation's rights, reducing hostilities and returning to the nuclear deal are steps that can be taken to pave the bumpy road of talks between Iran and America," Hamid Aboutalebi, an adviser to Rouhani, tweeted. Analysts do not expect a Trump-Rouhani meeting anytime soon, pointing out that Trump has, for some time, been seeking to meet Rouhani directly without success. "I don't think it will happen in the immediate future," said Jarrett Blanc, senior fellow of the Geoeconomics and Strategy Program at the Carnegie Endowment for International Peace. Iran, with a more complicated domestic political structure than the totalitarian model of North Korea, has been cool to the idea of diplomacy with Washington, more so since Trump pulled the United States out of the multinational nuclear accord, which imposed restrictions on Iran's ability to build nuclear weapons in exchange for sanctions relief. Other signatories are working with Iran to try to save the agreement while Washington begins reimposing sanctions on Tehran that are to start taking effect in August. Trump, just eight days ago, issued a direct counterthreat to Tehran in an all-capital-letters tweet in which he sharply warned Rouhani to "never threaten the United States" or the Islamic Republic would suffer historical consequences. Just hours before that tweet, Rouhani had warned Trump's policies could lead to "the mother of all wars." A combination of two pictures shows U.S. President Donald Trump (L) on July 22, 2018, and Iranian President Hassan Rouhani on Feb. 6, 2018. "No Iranian leader is likely in the near future to meet with a president who has repeatedly threatened Iran, insulted its leadership and violated the nuclear deal," said Ali Vaez, Iran project director at the International Crisis Group.